Late last year, the Trump administration imposed tariffs of 25 percent on steel and 10 percent on aluminum imports from some of America’s biggest suppliers in Canada, the European Union (EU) and Mexico. While the policies punish foreign trade partners, domestic companies also feel their consequences, with U.S. suppliers unable to keep up with demand for steel and aluminum. To satisfy their production needs, welders must continue doing business with foreign suppliers subject to tariffs. The result? Rising supply costs. 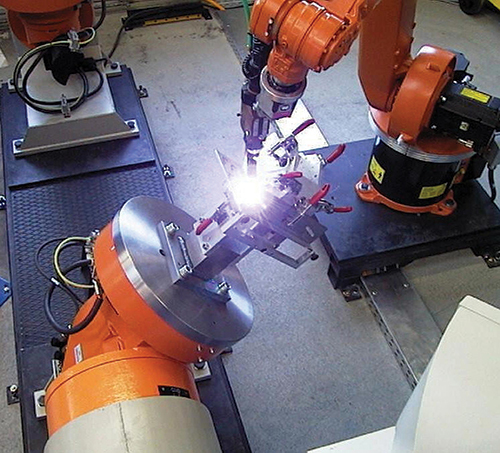 A gas-metal-arc-welding application uses Kuka's DKP two-axis positioner, making sure that the weld is placed in the correct position. According to recent research conducted in the Netherlands, 5 percent of metalworkers and mechanical engineers missed at least one day on the job due to work-related accidents. Considering some of the risks faced by these occupational groups, such as extreme temperatures and exposure to hazardous fumes, it’s no surprise that metalworkers and engineers lead the pack in terms of absences. According to the United States Department of Labor, businesses spend $170 billion a year on injuries and illnesses. And although workplace accidents will happen, you can control the rate at which mishaps occur by offboarding more dangerous tasks to robots. Making safety a top priority improves retention and provides a boost to your bottom line. Like safety, better workplace engagement generates savings. Research from Gallup, Inc. estimates that organizations with a high degree of employee engagement are 21 percent more profitable than companies lacking an engaged workforce. What single fact most affects worker engagement? Variability. No worker wants to perform the same task for months on end. Avoid repetition by turning over tasks to robots. Being more proactive about giving workers a break from routine activities leads to a better chance of elevating engagement rates. While there is no way around the upfront costs of robots, the investment pays off over time, with Gallup research showing that disengaged workers are more likely to look for other opportunities. As employee turnover increases, a spike in recruiting costs trails closely behind. It takes an average of 42 days and more than $4000 to fill an open position. Sidestep the financial impact of replacing employees by improving engagement through robotics. Workers who have the chance to assume a new set of responsibilities may be less inclined to lose interest. After reaching $32 billion in 2017, according to Technovia Research, we can expect the global robotics market to top $75 billion by 2022. The 200-plus-percent growth rate reflects the increasingly important role of robotics in society. Once dismissed as a far-off fantasy, robots have popped up in workplaces across industries. For some, however, the emergence of robotics is not a welcome sight. A recent study published by Elsevier Ltd. suggests that employees working in industries with a higher risk of automation may experience a decrease in physical and mental health. Although concerns over robots are widespread, a closer look at the impact of innovation reveals not much to worry about. In fact, robots are poised to help more than they hurt. Whether through an upcoming vacation or family emergency, human workers may not be available in several situations. Robots, on the other hand, can start working at a moment’s notice. Just remember to schedule regular maintenance. In addition to mitigating the impact of rising steel and aluminum prices, you can leverage productivity gains to enhance the employee experience. From raising salaries to introducing new benefits, you have ways to improve employee satisfaction. Given the fact that nearly 90 percent of the workforce believes that continuous training is important or essential to career success, according to Pew Research, try offering new professional development opportunities that employees can enjoy as robots assume greater responsibility. Robots are not demanding. Beyond the occasional repair, robots do not need much to perform their best work. Take advantage of robots’ adaptability by searching for ways to cut back on operating costs. While employees may not be productive when the temperature drops below 65 F, robots will not miss a beat. Turn down the thermostat in areas of your organization that exclusively house robots. The savings may not seem like much at first, but they add up. Another way to slash operating costs without influencing performance: position robots more closely together. As your company grows, space becomes a hot commodity. Rather than searching for a new location that costs hundreds of thousands of dollars, use robots to reduce your footprint. Unlike employees, robots function well in confined and dimly lit spaces. According to research conducted by Udemy, 58 percent of U.S. office workers check Facebook, Instagram and Twitter throughout the day. This same online temptation exists, of course, for your workers. The Udemy research also shows that half of the workers admit that they do not perform as well while distracted. Unlike their human counterparts, robots won’t fall victim to workplace distractions. A University of California Irvine study found that it takes an average of 23 min. and 15 sec. for workers to refocus following a distraction. With robots, such wait-time issues do not exist. See also: KUKA Robotics Corp.